With a client roster that reads like a list of Academy Awards nominees, you wouldn’t guess that George got into fitness because of a lack of self-esteem. But as a kid, he wanted muscles he didn’t have. So he made them. In 1980, George placed second in the state in power lifting. Next came Mr. Marin, Mr. North Bay and Mr. San Francisco. Then George embarked on his life’s work: studying the movement and structure of the body and sharing that knowledge as a consultant and personal trainer. Along the way he acquired an impressive array of certifications. 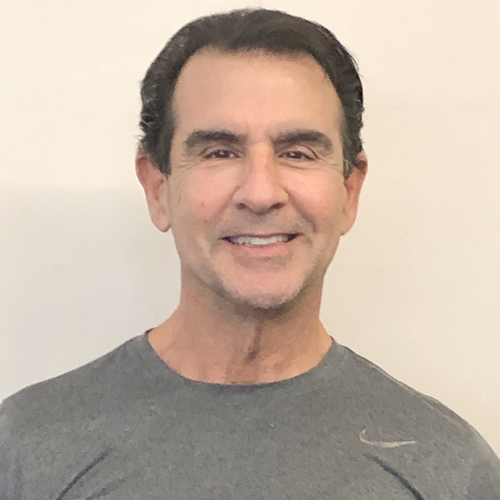 Sitting alongside physical therapists and chiropractors in classes on physiology, biomechanics, anatomy, kinesiology, sports nutrition, cardio-respiratory conditioning and strength conditioning, George has learned from the Bay Area’s best physiotherapists and physiologists. He shares his knowledge with other trainers, and his clients. Of course, his clients benefit most, and not just from his expertise but also from his mindful, accessible approach. George often uses no-load exercises and integrative movements to balance and strengthen the whole body. Appreciating that at first many people feel self-conscious in a gym, George often introduces new clients to “gym regulars,” so that the next time they work out they feel more comfortable. To teach people to move with awareness and eventually do what they didn’t feel they could.